"I get bored of regular red sauce meatloaf. I've combined my version of holiday stuffing and turned it into a meatloaf. This alternative is delicious and full of veggies and apples. Instead of using bread crumbs, crackers, or oatmeal, try Pepperidge Farm® Herb Seasoned Stuffing! Perfect for fall-winter comfort-style dinners. Pairs well with traditional mashed potatoes and dinner rolls. After experimenting several times over the course of a few years, I've come up with what I call 'Meatloaf Stuffing'. You can use ground beef if meatloaf meat is not available. Enjoy!" Mix meatloaf meat, apples, onion, stuffing mix, celery, milk, water, eggs, garlic powder, salt, and black pepper together in a bowl until ingredients are evenly combined. Spread cream of mushroom soup into a 9x5-inch loaf pan. Spoon meat mixture into the loaf pan and use a spatula to gently flatten the top of the loaf. Bake in the preheated oven until no longer pink in the center, about 1 1/2 hours. An instant-read thermometer inserted into the center should read at least 160 degrees F (70 degrees C). Cool in pan for 5 to 10 minutes. Flip meatloaf pan upside-down onto a serving platter so the cream of mushroom soup is on the top of the loaf. 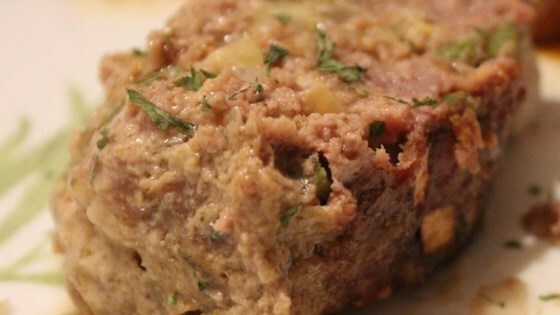 This is by far the top meatloaf recipe we have tried. It was a tiny bit on the salty side. Just cut the salt in half if you do not like salt. We really enjoyed this! So unique! Great flavor and what a change from your usual meatloaf. Difference - - I used all organic beef. Absolutely amazing! I used less milk and no water though. I always bake in glass - so 9x13 glass pan! It was so great we couldn't stop eating before I remembered to take the picture.